The Alliance of American Football is a brand new league that launched in February of 2019. The league provides football lovers with the chance to watch competitive games during the NFL offseason. Also, the founders hope to include sports betting in the future. To learn more about the Alliance, read the full review below. A number of top sportsbooks in the US are currently carrying the Alliance Football League games. This gives users the chance to examine AAF odds, picks, and the spread on a variety of betting markets. These markets feature both pre-match and live bets. With many states looking to legalize sports betting, the Alliance Football League chose a great time to enter the market. The AAF stated they will focus on sports betting. Similarly, they are hoping to integrate live betting into the AAF app. The app focuses on AAF betting and gives users AAF odds, picks, and the spread. Currently, the AAF app allows users to watch AAF games through a live gamecast. However, we expect them to integrate a betting function directly into the interface. This means AAF betting on odds and making AAF picks could happen in the app. The AAF or Alliance of American Football is a professional football league created based on the alliance between players, fans, and the game. Founded by producer Charlie Ebersol and NFL Hall of Famer Bill Polian, the Alliance plays a 12-week season. The relatively short season fits nicely within the NFL season. The first AAF season kicked-off on February 9th, 2019. Naturally, the season culminates with the championship game on the weekend of April 26-28th, 2019. As stated, Alliance Football attempts to fill the gap between NFL seasons and provide football fans and bettors with a chance to watch/wager on top-quality football throughout the year. The league can be viewed by either downloading the AAF App or on TV. Notable members of the AAF include former Pittsburgh Steelers safety Troy Polamalu, Steelers wide receiver Hines Ward, Oakland Raiders DE Justin Tuck, and retired referee Mike Pereira. At the moment, Alliance Football consists of 8 teams from all over the country in two conferences. The teams feature a number of ex-NFL players and coaches. Many of the teams are from cities in the US that lack an NFL team. Likewise, the league is split into two conferences. While very similar to the NFL, the Alliance Football League does have a number of unique rules. Most changes attempt to create more excitement in the game. Below, read some of the bigger changes to the game. No extra point kicks in AAF Rules. Instead in AAF Rules, teams must attempt two-point conversions after each touchdown. In AAF Rules, the defense will be able to only rush a maximum of five players. The AAF Rules also stipulate that a defensive player cannot cross the line of scrimmage from more than two yards outside the OTs. With AAF rules, kickoffs have been done away with. Possession for each team will start on a team's own 25-yard line. Only after a safety will the scoring team receive possession at their own 35-yard line. For AAF Rules, the play clock is 5 seconds shorters than the NFL play clock at 35 seconds. Overtime uses ‘Kansas Playoff’ rules where each team will begin on their opponent's 10-yard line and be given one possession to score a touchdown. The playoffs will consist of fours teams. The top two teams of each conference. A sky judge keeps an overview of each play, assisting the on-field referees. This advancement is expected to make the games go faster. As mentioned, the AAF schedule plays from February to late April, filling in the gap between NFL seasons. Each of the 8 teams has 10 regular season games. Additionally, each team plays each week without any bye weeks. The AAF schedule for the playoffs consists of the top four teams at the end of the regular season. As such, the penultimate games will be the 20th and 21st of April. Then, the two winners will meet in the championship. The championship will be held Saturday, April 27th. Users may use the AAF app to keep up with the AAF schedule and find out which teams are playing each week. Many of the games are even live streamed through the app, allowing users to watch the game for free. Thankfully, the AAF App is available on both iOS and Android devices and can be downloaded by either visiting the AAF website or the iTunes Store and Google Store, respectively. Users can not only watch games via live stream but also play a variety of fantasy games as the game plays on. 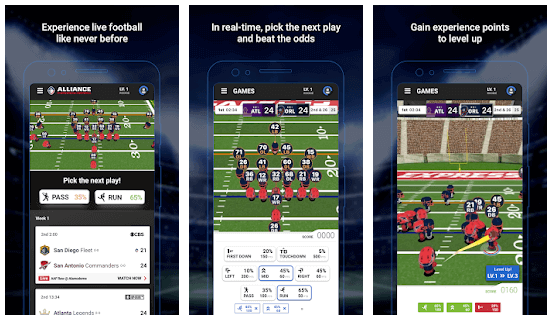 The AAF App is expected to feature AAF betting on AAF odds, picks and spread in the near future as soon as sports betting expands into more states in the US. The sports betting feature will integrate right into the viewing and fantasy section of the app, which should give users the chance to bet on games as they occur with fluctuating odds. Be sure to keep an eye on the AAF App if you’re looking for an easy way to place AAF bets in the near future. If you’re wondering how to watch Alliance of American Football, the AAF broadcast is covered by CBS, TNT, and the NFL Network. The AAF broadcast on CBS will host one game per week and one of the playoff games as per their AAF schedule agreement. These games will not be available via livestream on the AAF mobile app. TNT will AAF broadcast two games per season (one regular season and a playoff game) and the NFL Network will broadcast two AAF games each week during the regular season. Alternatively, the AAF mobile app will offer an AAF broadcast via live streaming of all games except those broadcast on CBS. The AAF app has a few integrated fantasy games which can be played alongside the live stream of each game. Select games will also be available for AAF broadcast on satellite radio at SiriusXM. The Alliance League is into its fifth week at the moment which marks the halfway point. The league is just starting to find its form. Impressively, the Orlando Apollos ran a perfect season thus far, with a 4-0 record to lead the Eastern Conference. Likewise, there's a dead heat between the San Diego Fleet, San Antonio Commanders, and Arizona Hotshots on top of the Western Division. Big matchups to watch during week 5 are the games between San Diego and Arizona who are vying for the top spot in the West and Birmingham and Memphis who are each looking to cement their place as contenders in the East. Week 5 could be pivotal in the result of the top two teams of each division that will eventually reach the playoffs. Expect all the teams to be playing their full strength squads and provide great AAF odds, picks and spread for betting. If you’re looking to purchase tickets to any of the games you may visit the AAF website and click on the ‘GET TICKETS’ button next to any of the games to buy your tickets online. Tom Dundon: the Alliance League announced that Tom Dundon, a holder in the Carolina Hurricanes, had agreed to invest $250 million into the Alliance League. He was named the new chairman of the Alliance Football League and reportedly received a majority stake in the league in exchange for his investment. MGM Resorts: MGM Resorts International made an investment in the AAF tech platform as well as entering into a three-year sponsorship agreement to become the league's official sports betting sponsor. Other notable investors include Founders Fund, The Chernin Group, Jared Allen, Slow Ventures, Adrian Fenty, Charles King's M Ventures. The Alliance League is a brand new American Football League. It launched in February of 2019. The league attempts to fill the gap between NFL seasons. Also, it provides viewers in non-NFL team cities a chance to root for a hometown team. Is there AAF betting available? Yes, users may wager on AAF odds, picks, and the spread on a number of different online and land-based sportsbooks in NJ. Soon, the league hopes to implement a tool on the AAF mobile app to take wagers. If you’re wondering how to watch AAF, you can watch the AAF broadcast on CBS, TNT and the NFL Network. Alternatively, all games which are not telecast on CBS can be viewed on the AAF Mobile App. Is there an AAF App? Yes, there is an AAF App available for both iOS and Android devices which can be downloaded by visiting the Alliance Football website or visiting the iTunes or Google Play Stores.